Vacation Barefoot Travel Blog: Black Friday camera deal from Amazon! Black Friday camera deal from Amazon! Black Friday is ON! 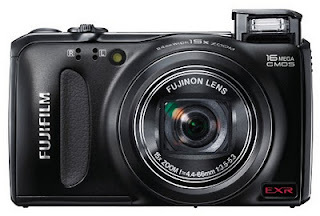 Here's a wicked good camera from Fujifilm that ordinarily costs $399, yours today for $199. That's a steal! It's a 16 megapixel monster that will take amazing shots on your next travel destination. This is one day deal from Amazon (according to them) so if you're in the market for a new camera, this might be the one for you. Following in the footsteps of the award-winning FinePix F200 EXR and F300 EXR models, this latest recruit to the range is the ideal camera for discerning point-and-shoot photographers or SLR users who want to travel light but don't want to compromise image quality and picture-taking versatility. Superb results are assured with exciting new features including an innovative 16 megapixel EXR CMOS sensor, a 15x wide-angle zoom lens, Full HD video functionality and an improved user interface. With a stylish design and pocketable dimensions, the FinePix F505 EXR is set to become the must-have compact in 2011. Check it out at: Fujifilm FinePix F505 - $199 today only.